Train Town is the Charleston area’s favorite retailer for THOMAS & FRIENDS wooden railway products. Look to us first for the latest Island of Sodor characters, accessories, and play sets. 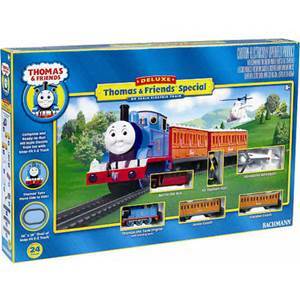 When it's time to chug along at a faster clip, THOMAS & FRIENDS electric train sets come complete with track and transformer in O-scale made by Lionel and in HO-scale made by Bachmann. THOMAS electric trains will run on an existing layout of the same scale. Cars are also sold separately.